The March For Our Lives Georgia chapter also uses its platform to raise our country’s social consciousness to the plight of the communities that are most affected by gun violence. It is critical to amplify the voices of Black and Brown youth, who have been speaking out against gun violence for generations. According to Everytown for Gun Safety, gun violence is the leading cause of death for Black children, who are also 14 times more likely than White children to lose their lives to gun violence. To these teens, other March For Our Lives chapters can uplift Black and Brown voices in a way that speaks with them, is mindful of the fact that different communities are impacted by gun violence in different ways, and doesn’t perpetuate tokenization. “We have to make sure that we are fighting for solutions that address gun violence in the communities that are most affected by gun violence and not necessarily where gun violence gets the most attention,” said Royce. In an educational system that disproportionately targets Black and Brown students, alternatives to increased police presence to promote school safety are important to these teens. These activists believe that implementing counselors, restorative justice programs that bring students together and mental health professionals is needed. “Making sure that students have a direct accessibility to a mental health professional and a resource they can outlet themselves to is needed,” said Nurah. 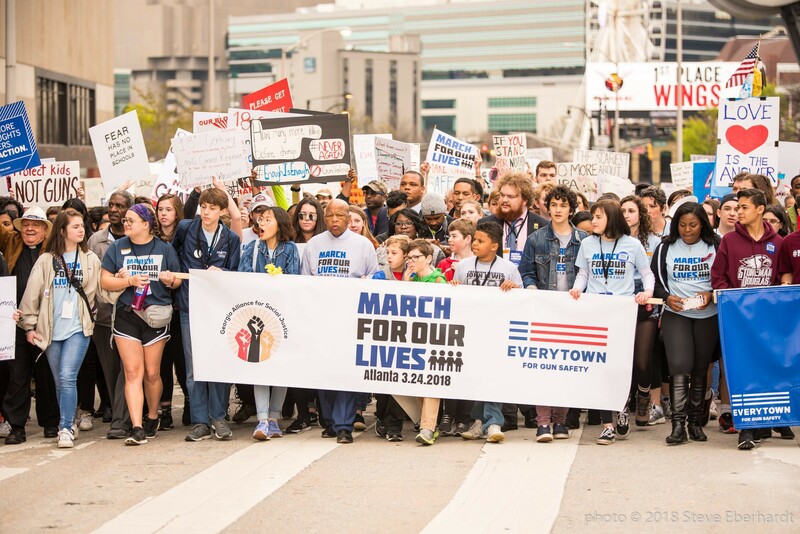 Intergenerational activism and organizing is vital to the Georgia chapter of March For Our Lives, who has collaborated with Representative John Lewis and other Civil Rights leaders. “We should be treated as equals because children as young as 14 are tried as adults in court, but they’re not treated as adults in the legislative process,” explains Isabelle. “We probably wouldn’t have to put up such a big fight. We’d probably have more support on bills, get a lot of stuff done and gun violence wouldn’t be such a big issue if we had the support of every adult, but we don’t, so we have to keep fighting,” said Nurah. To these activists, a world in which adults supported young folks in this fight would be a world in which they would work together to be the change they want to see.